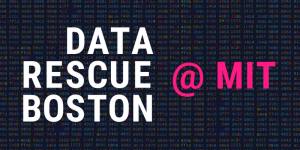 DataRescue at MIT is a hackathon focused on identifying, downloading, processing, and mirroring federal research data at risk of being taken down or obscured by the current administration. The event is hosted by MIT ACSES, MIT Libraries, and the Environmental Data & Governance Initiative (EDGI). We will also need volunteers to help run the event. In particular, we need people who have experience in scraping data, working with and ensuring the integrity of large data sets, and/or are comfortable leading groups. Sign up to volunteer (volunteers should still register for a ticket). This event is part of a larger DataRescue Boston movement, which includes events and collaborators at Harvard, Tufts, and Northeastern, which is in turn part of a larger national DataRescue movement organized by EDGI and UPenn’s Program in the Environmental Humanities.